Vernon Street plays host to this affordable ‘premier’ lodge in Liverpool City Centre. Located outside Moorfields Station. If you want to spend the weekend exploring Beatle City and all the fab landmarks associated with it like the Cavern Club on Matthew Street or the real life Penny Lane and Strawberry Fields in the Wavertree area. It’s a basic yet smart affair, low on thrills and spills but big on service. 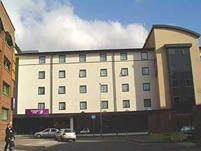 The hotel can be found just outside Moorfields Train Station which serves the Wirral and Northern Lines of the Merseyrail Network. Liverpool’s Albert Dock is just a five-minute walk down Water Street. The Momentum Leisure Club is just around the corner on London Road, where there is also a good range of pizza takeaways and delivery services and of course, a Tesco Express!. Convenient and terrific value for money. Spacious rooms and soft, comfortable beds. On site restaurant serves a hot and cold buffet breakfast with a good range of traditional ‘pub’ dishes also served at lunch and dinner. NCP Parking available opposite the hotel a tad expensive and at Smithfields somewhat cheaper.